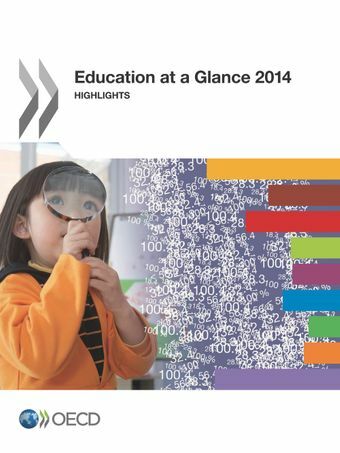 Education at a Glance 2014: Highlights summarises the OECD’s flagship compendium of education statistics, Education at a Glance. It provides easily accessible data on key topics in education today, including: • Education levels and student numbers: How far have adults studied, and how does early childhood education affect student performance later on? • Higher education and work: How many young people graduate from tertiary education, and how easily do they enter the world of work? • Economic and social benefits of education: How does education affect people’s job prospects, and what is its impact on incomes? • Paying for education: What share of public spending goes on education, and what is the role of private spending? • The school environment: How many hours do teachers work, and how does class size vary?Each indicator is presented on a two-page spread. The left-hand page explains the significance of the indicator, discusses the main findings, examines key trends and provides readers with a roadmap for finding out more in the OECD education databases and in other OECD education publications. The right-hand page contains clearly presented charts and tables, accompanied by dynamic hyperlinks (StatLinks) that direct readers to the corresponding data in Excel™ format. How many young people finish secondary education? Does parental education affect students' chances? How many young people enter tertiary education? How many young people graduate from tertiary education? How successful are students in moving from education to work? How much more do tertiary graduates earn? How are student performance and equity in education related? What share of national wealth is spent on education? How do public and private schools differ? How much do tertiary students pay? What are education funds spent on? How long do students spend in the classroom? Why are adult skills important? Why do we need computer skills? Why do we need creative problem-solving?